When it comes to fall hair care my routine varies dramatically. I have psoriasis, a condition in which skin cells build up and form scales and itchy, dry patches. It is painful, irritating and actually quite gross. If you get to really thinking about it. The dryness of the fall weather change tends to irritate my skin causing my psoriasis to flare up. All this results in my hair care routine changing with the seasons. In the fall and winter I need something with a bit more soothing moisture to calm my irritated scalp. These are the products I use all throughout the fall and winter to keep my hair and scalp as happy as can be. The coconut miracle oil shampoo is a reviving, nourishing, and literally miracle working blend of coconut oil, vanilla bean extract and essence of Tiare - a tropical flower from Tahiti. This shampoo does wonders with my dry and itchy scalp when I need just a little extra care. I also have curly wavy hair and when I want a more natural look it doesn't weigh my hair down. I am a firm believer that when the experts make a range and design two products to fit together you should use them together. Now this may be my OCD or maybe they really do perform the best when used as a dynamic duo but this partnership has never let me down. The moisture rich conditioner soaks my strands in silky softness. Plus, I think this combo helps my hair grow. Not sure if that's the case but I believe it to be true. After the shower I always use an oil and starting fall and all throughout winter this is the one I switch too. Not only does it smell incredible and pair with the in shower products, it also gives my hair the extra damage remedy boost it needs to make it through even the most chilly of windy days. Apply to damp hair and either let air dry or style as normal. If I am blow drying which is something I try to avoid if all possible I will apply a little extra to my fingertips and massage into my scalp to aid against drying out. This is not a dry shampoo that will give you added texture or loads of volume, but that's what I love about it. With the OGX products being paraben and phosphate free no chemical residue will be lingering on my hair or scalp causing added irritation. This dry shampoo soaks up extra oils extending your look or managing your style all day and night long. On the rare occasion I do style my hair or need a particular look to stay in place I avoid hairspray a little extra in the cooler months, due to my scalps sensitivity. So instead and most times out of the year I substitute this sea salt texturizing spray. I don't use hairspray much for anything because I am lucky to have hair that holds a curl very well. However, if you are looking for a hairspray alternative I highly recommend giving this a try. Once a week throughout the fall and winter I do a coconut oil hair treatment. I used to use just plain coconut oil like discussed in my 15 COCONUT OIL USES FOR MOMMY blog post. However, I found a easier more nourishing way to complete my weekly hair spa treatment with this SheaMoisture spray and leave in coconut oil treatment. 100 percent Extra Virgin Coconut and Shea Oils, Coconut Milk and Acacia Senegal combine in this restorative formula that re-hydrates hair, detangles and acts as a barrier against heat while reducing frizz. 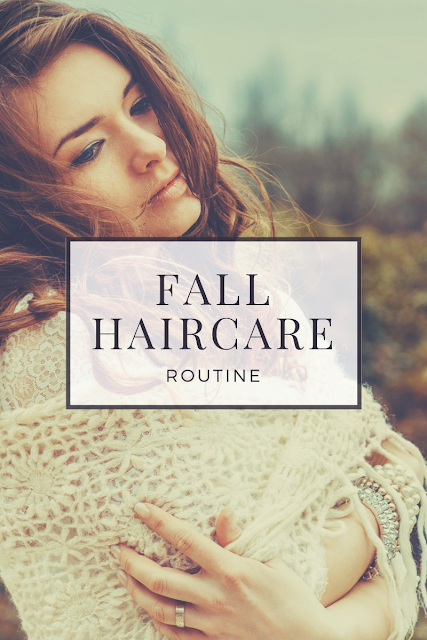 If this isn't in your fall hair care routine it definitely should be.